Samantha Shorkey, a local vegan bodybuilder, shares two of her most popular recipes with CBC Radio's All in a Day. Samantha Shorkey says she was told for years that she could never become a bodybuilder because of her vegan diet. Samantha Shorkey is a vegan coach based in Ottawa. (@SamanthaShorkey/Twitter)Today, she's written a book on vegan bodybuilding and was the first vegan bikini pro at the World Natural Bodybuilding Federation. "I had been vegetarian and vegan [for 27 years] and I knew that there had to be a way," she told CBC Radio's All in a Day. "I just replaced animal sources of protein with vegan sources." Shorkey is a vegan fitness coach, writes her own blog and creates her own recipes for building muscle on a vegan lifestyle. She plans to be at the Ottawa Veg Fest this weekend to share some of her food creations and her work as a bodybuilder. She shared two of her recipes with All in a Day host Alan Neal. 1 brick of extra-firm organic, non GMO-tofu (350 g). 2 tbsp. Bragg's liquid aminos (healthy soy sauce alternative). 1 tbsp. finely minced garlic (3 to 4) cloves. Drain tofu and then wrap in a paper towel and press out as much water as you can. 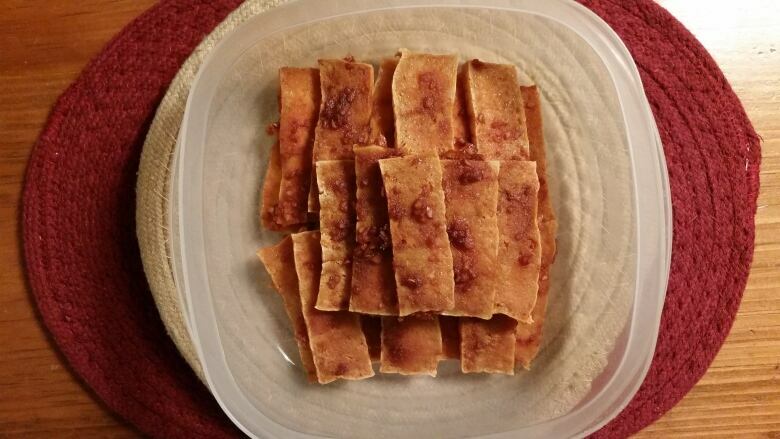 Cut tofu into thin slices (0.5" thick). Combine Bragg's, Sriracha and minced garlic in a small bowl. Set it aside. Line a couple of dehydrator trays with parchment paper. Arrange tofu slices on trays then brush each side with sauce. Dehydrate for 4 to 5 hours. Remove once dry and tough. 1 cup rolled (quick) oats. 3 tbsp. ground flax seed. 1 tbsp. pure vanilla extract. Optional: little bit of water (if dough is dry). Add 1 tbsp or 2 of water if dough is too dry. 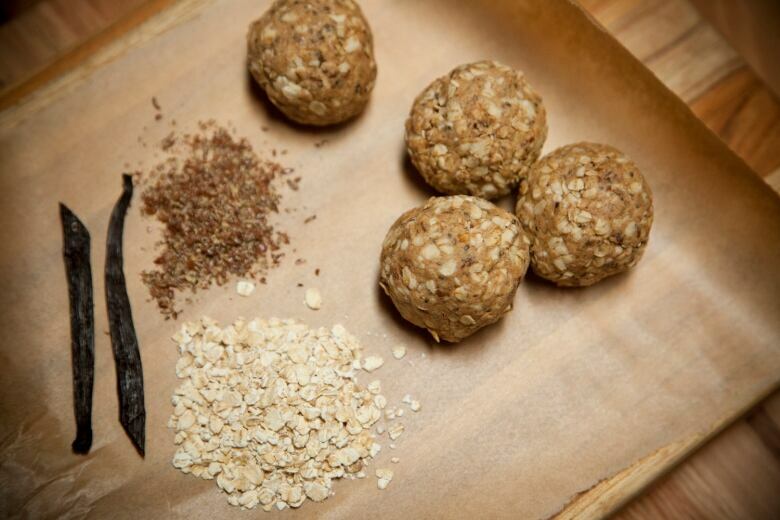 Place in freezer and allow balls to harden for at least 30 minutes.